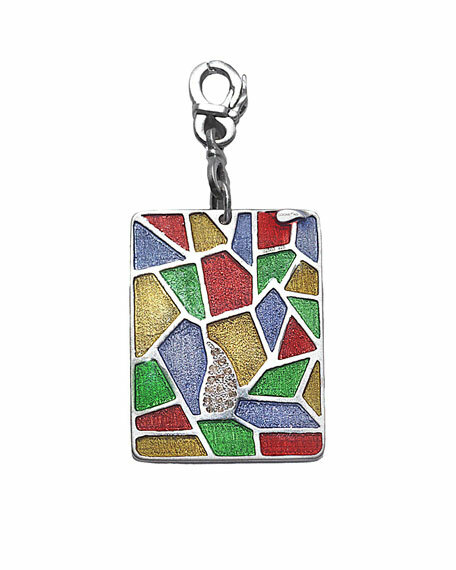 COOMI pendant from the Sagrada Familia Collection. 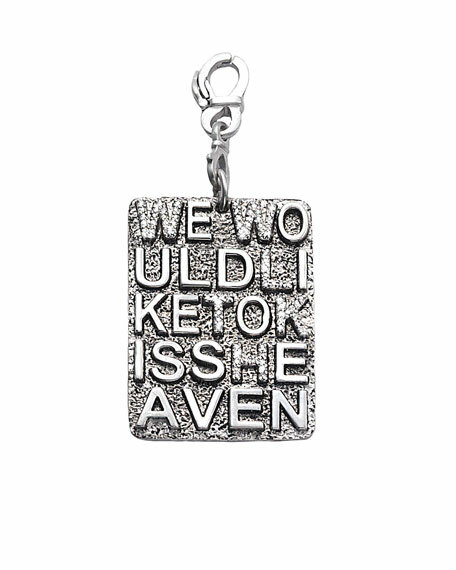 Sterling silver with engraved "We Would Like to Kiss Heaven" message. Pavé diamond accents and colorblock reverse; 0.28 total carat weight. Slides easily onto cord/chain (sold separately). Armenta scroll enhancer pendant. From the New World Collection. Sterling silver with matte finish. Pave champagne diamonds and blue sapphires. Armenta scroll enhancer pendant. From the New World Collection. Sterling silver with matte finish. Pave champagne diamonds and blue sapphires. 0.65 total diamond carat weight. Approx. 2.6"L x 1"W. Clip-back bale clasp. Necklace not included. Armenta triplet enhancer from the Old World Collection. 18-karat yellow gold and blackened sterling silver hardware. Oval silhouette with white enamel and four diamond crivelli. Bezel-set ice quartz, opal and mother-of-pearl triplet center. White diamond bale, inner trim and crivelli stations. 0.18 total diamond carat weight. Made in USA. Ashley Pittman multi-stone pendant. African horn and hand-inlaid bronze. Four bezel-set and mixed-cut stones. Citrine, sandstone and orange zircon. Hinged bale eases dress. Handcrafted in Kenya. Light amethyst pendant by Dina Mackney. 18-karat yellow gold vermeil hardware. Teardrop-cut light amethyst bezel. Hinged bale for slip-on style. Light amethyst pendant by Dina Mackney. 18-karat yellow gold vermeil hardware. Teardrop-cut light amethyst bezel. Hinged bale for slip-on style. Approx. 1.5"L drop; 0.8"W.